“Cannery Row in Monterey in California is a poem, a stink, a grating noise, a quality of light, a tone, a habit, a nostalgia, a dream.” So wrote John Steinbeck in his famous 1945 novel. “The Row” gets its name from a string of long-defunct sardine-canning factories, some of which have been converted into dog-friendly restaurants and hotels. 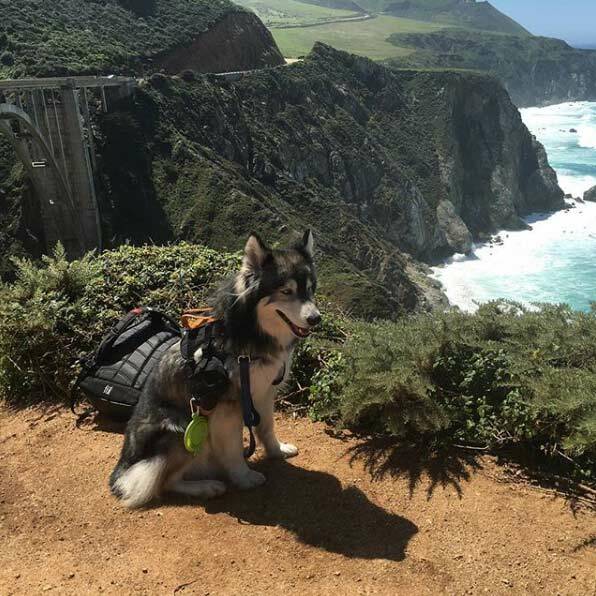 Today, it’s Monterey’s main waterfront tourist draw, the gateway to dog-friendly Monterey County and a destination in itself when it comes to dog-friendly things to do. • Bubba Gump Shrimp Co. is the first outlet of a chain themed to the 1994 hit movie “Forrest Gump.” It’s seafood-centric and family-friendly with a party atmosphere and a big dog-friendly patio. • The C Restaurant and Bar is an upscale restaurant in the dog-friendly InterContinental The Clement Monterey hotel on Cannery Row. For fine dining with a view, this is the place. • Cooper’s Pub is a Brit-inspired hangout with the largest selection of beers in Monterey. Enjoy live music weekends on the dog-friendly, heated outdoor patio. • Louie Linguini’s, on the second level above Steinbeck Plaza, has a heated patio where dogs are welcome to join you as you chow down on pasta dishes or trademark individual pizzas. • Cannery Row Brewing Company is what it sounds like: a beer-centric establishment with a huge brew selection, extensive pub-grub menu and a dog-friendly deck with fire pits overlooking Monterey Bay. If wine-tasting is more your thing, you can sample some of the county’s best fruit of the vine at Cannery Row’s Carmel Ridge Winery, Wine Experience and Blue Fox Cellars tasting rooms. Again, for dog-friendly lodging, check out the Clement and, on the more economical side, the Best Western Plus Victorian Inn, just a short stroll from the Row. Both offer pet-friendly packages and amenities. Not far away, in the nearby Old Town district, hacienda-style Casa Munras has special packages for DogTrekkers, a pup-friendly patio dining and room to roam.